Today I will return to Spain. I have found more materials, and am glad to offer more information on its rich culture. 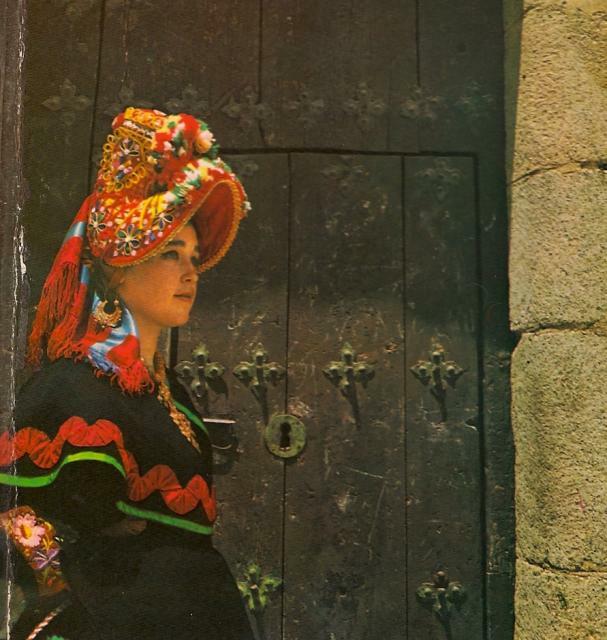 Montehormoso is found in the northwest of the province of Cáceres, not far south of the border with Salamanca province, whose Charro costume I have already written about. 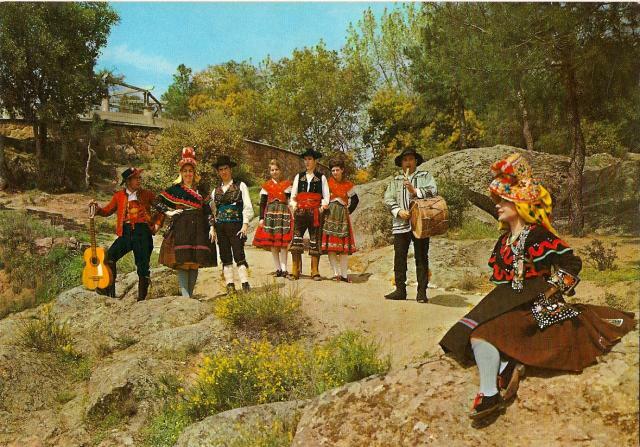 It is part of the traditional region of Extremadura. Here is a closeup map of the region, You will find Montehermoso in the northwest. 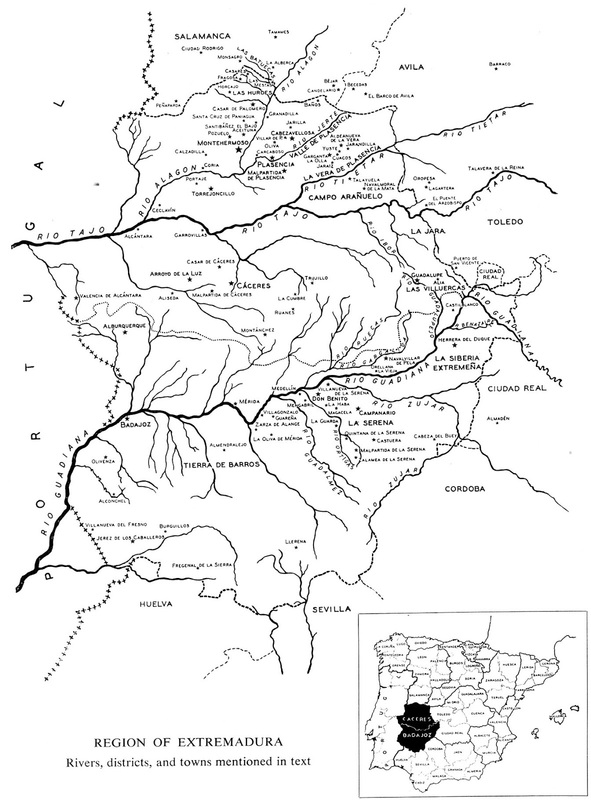 This area is home to the Extremaduran language, a descendant of the Language of Leon, which has slowly been displaced by Castillian since those two kingdoms were joined in the 1300's. 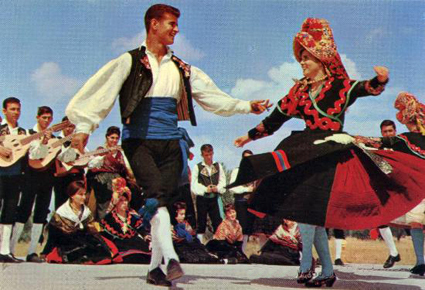 This region is very rich in folklore. 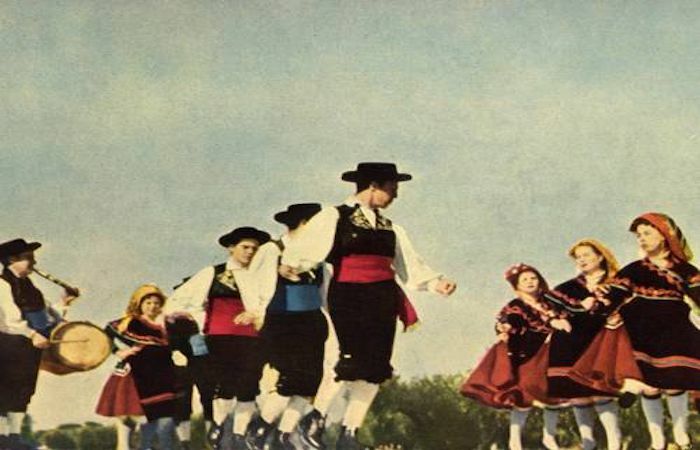 In the 1940's the costume was still in everyday use by most women, and is still retained for special occasions.The photo above is of a modern Folk-dance group, showing how the festive costume is usually worn today. The most noticeable part of the costume is the Gorra, the straw bonnet. 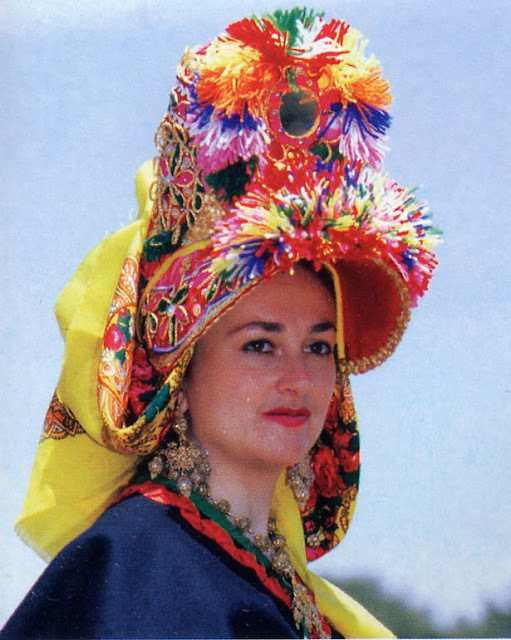 Straw hats, of course, are worn all over Europe and Asia, especially when outside in the sun, but the gorra of Montehermoso is exceptionally colorful, being decorated with straw braids, ribbons, colorful applique, buttons, pompoms and mirrors. 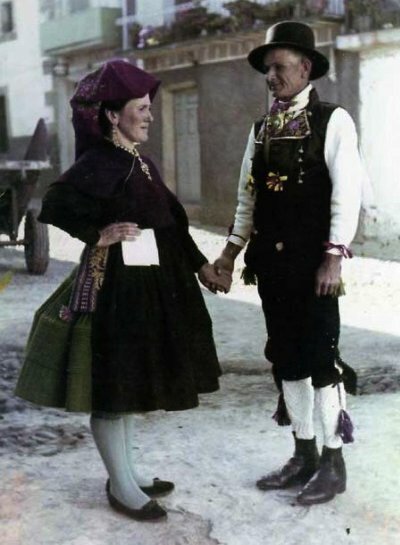 Although you will see the gorra worn as part of the festive costume today, this was not originally the case. 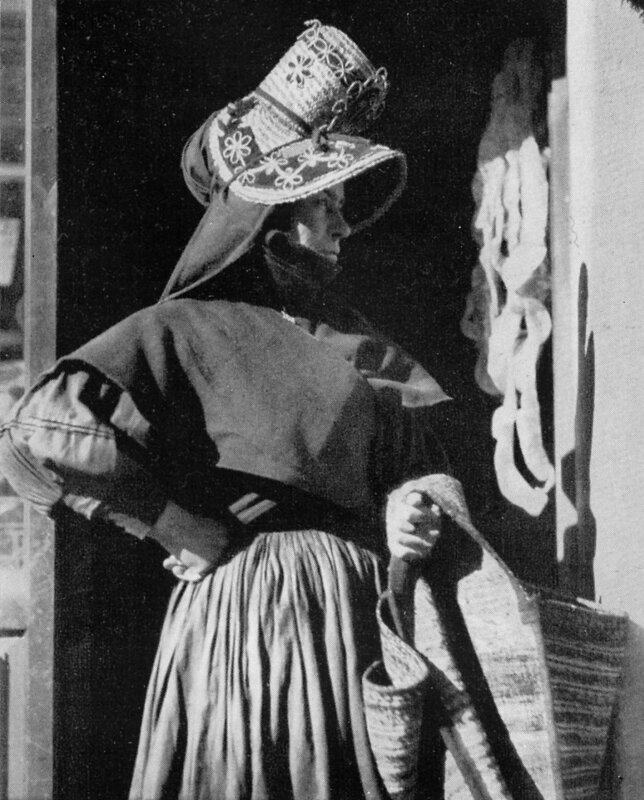 It was a sunbonnet, and was only worn when working or traveling outside in the sun. We have photos taken in the 1940's that show this. The gorra was worn by women from Montehermoso when selling or shopping in nearby towns, thus being immediately identifiable. 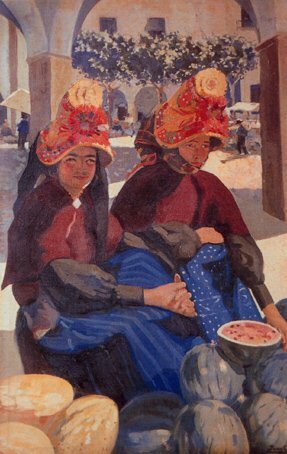 You will notice that these women are wearing the gorra tipped forward, as the woman in the yellow kerchief above does not. 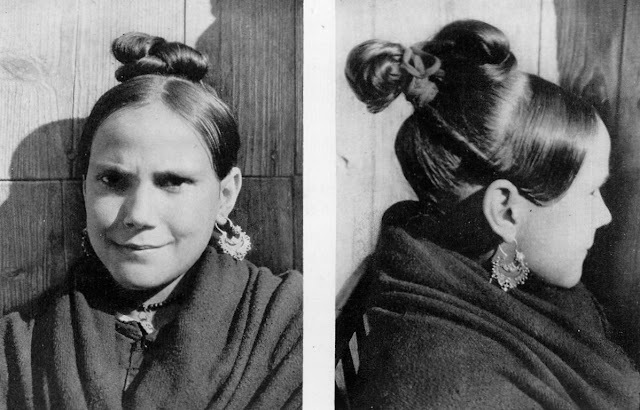 This is a result of the traditional hair styling of the town, which involves a topknot at the back of the head. This is why the gorra developed without a brim in the back. 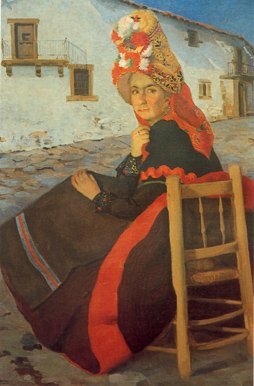 Since this hairstyle has since been abandoned, it is now difficult to wear the gorra at the proper angle. The gorra comes in three types. The one shown above in the color photo is the gorra galana. 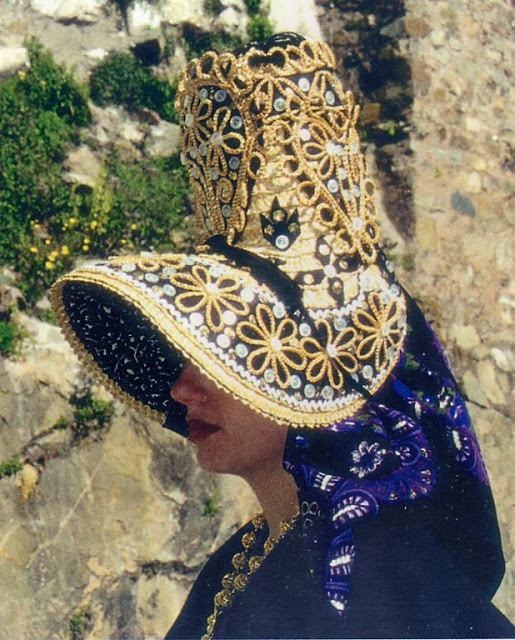 It is characterized by puffs of mulitcolored yarn and a mirror on the front of the crown. This is traditionally reserved for single girls. 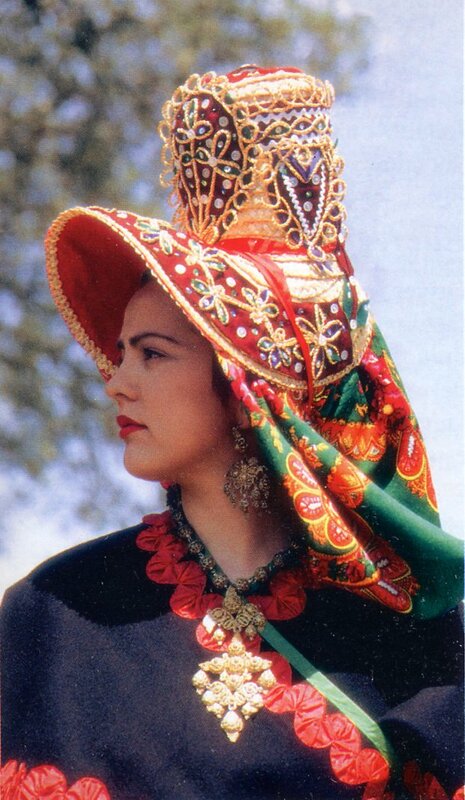 The second is the gorra mora. This is still brightly colored and highly ornamented, but lacks the pompoms and mirror. This is the normal bonnet worn by married women. 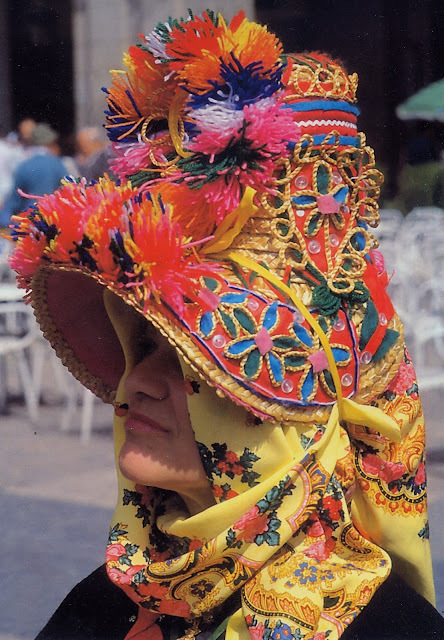 The third is the gorra de viuda. 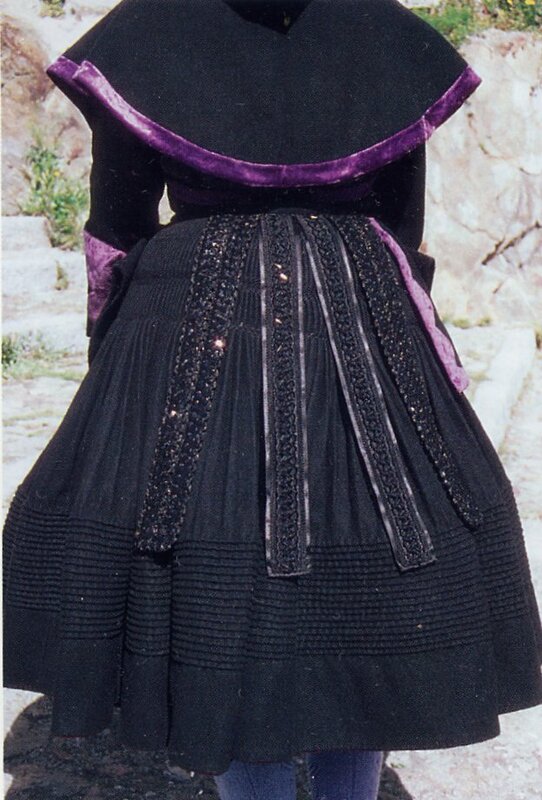 This is worn in times of mourning and by widows. 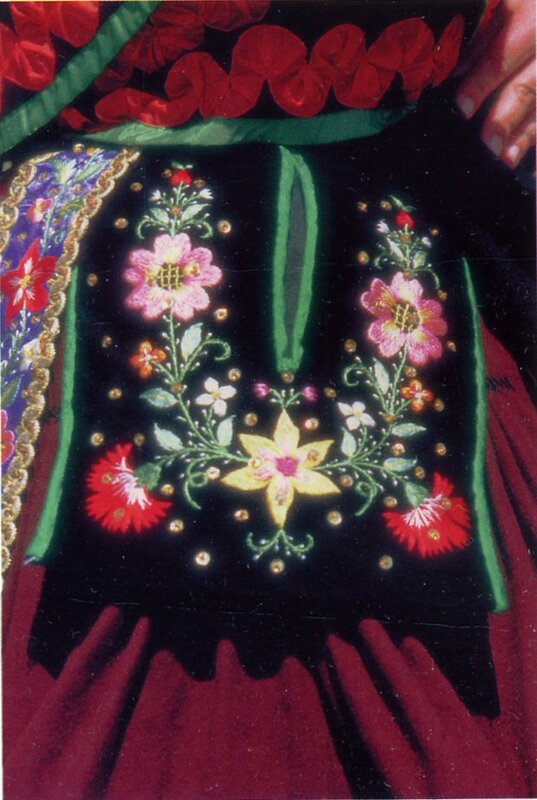 It is still highly ornamented, but the applique is restricted to black cloth. 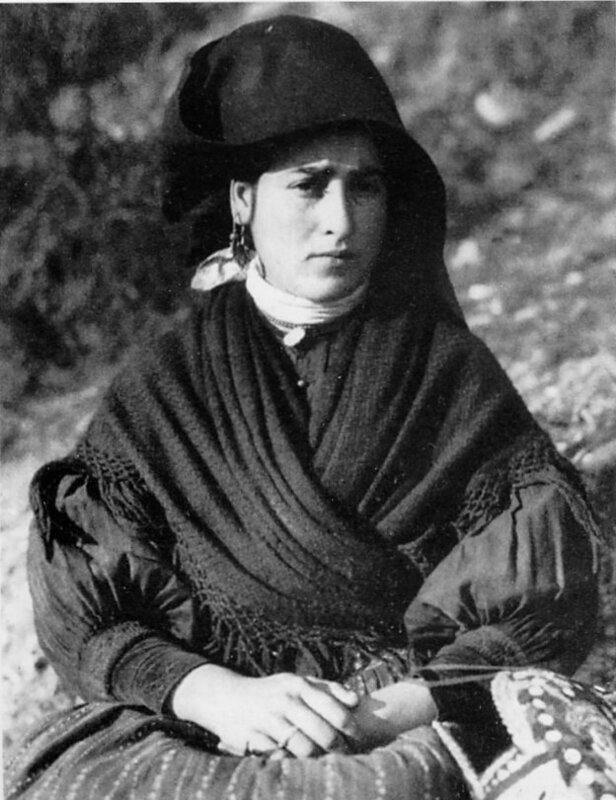 As you can see, the gorra is always worn over a kerchief. 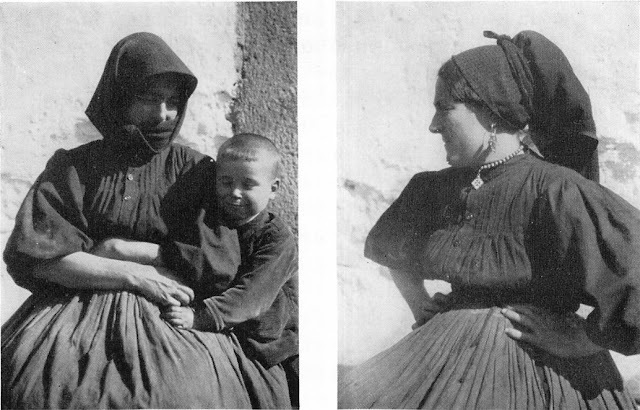 The everyday costume consists of a chemise, white petticoat, a blouse with many pleats and tucks, a minimum of two skirts, a full apron and a shawl wrapped around the shoulders and tied around the waist. You can see this in the photos above. 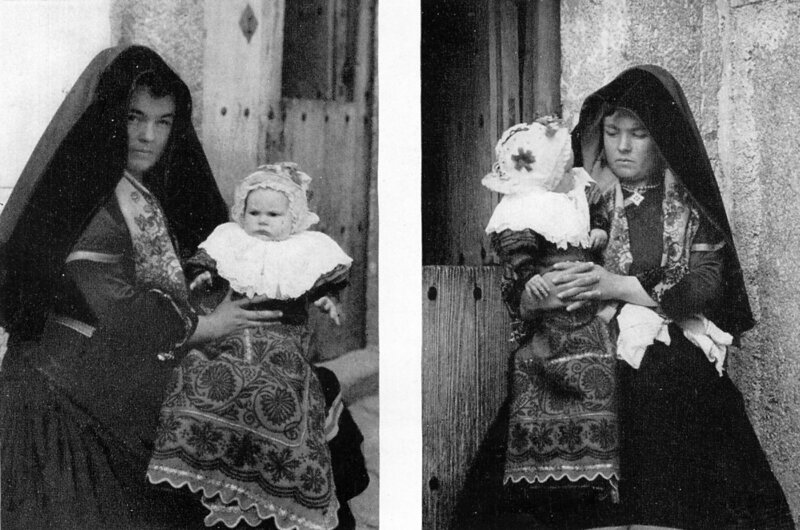 The newer festive costume is shown in the first photo. 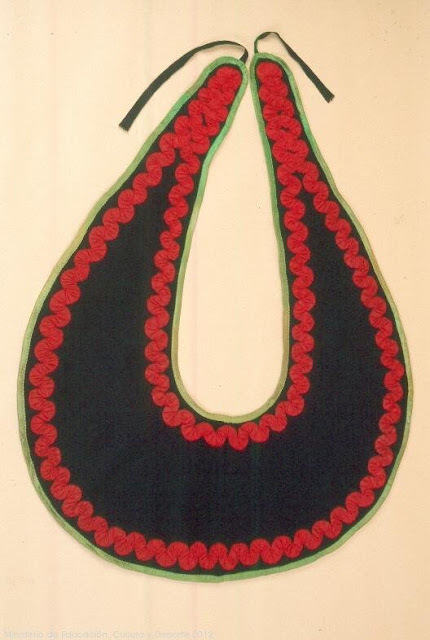 The everyday kerchief tended to be plain black, but the festive kerchief is in bright colors, preferably of silk. There is a bodice with sleeves worn over the chemise. 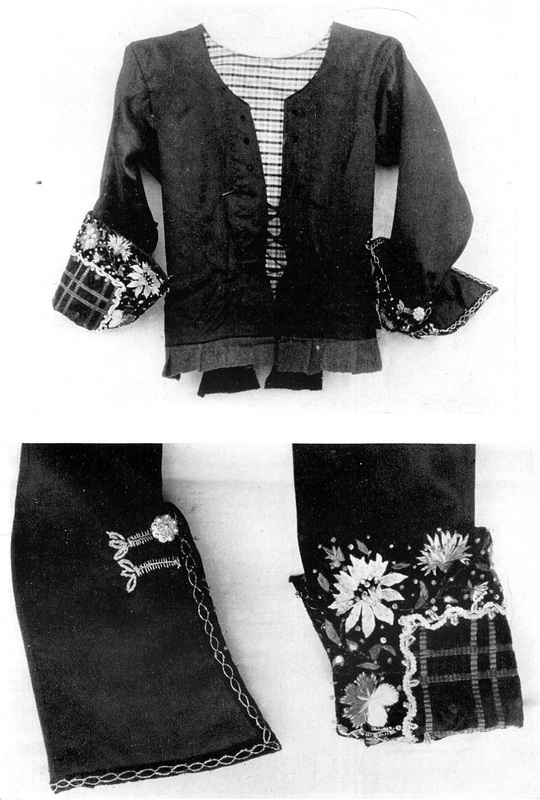 The sleeves are long, and the ends are folded back to make a cuff. This is faced with fancy cloth, and ornamented with ribbon and embroidery. 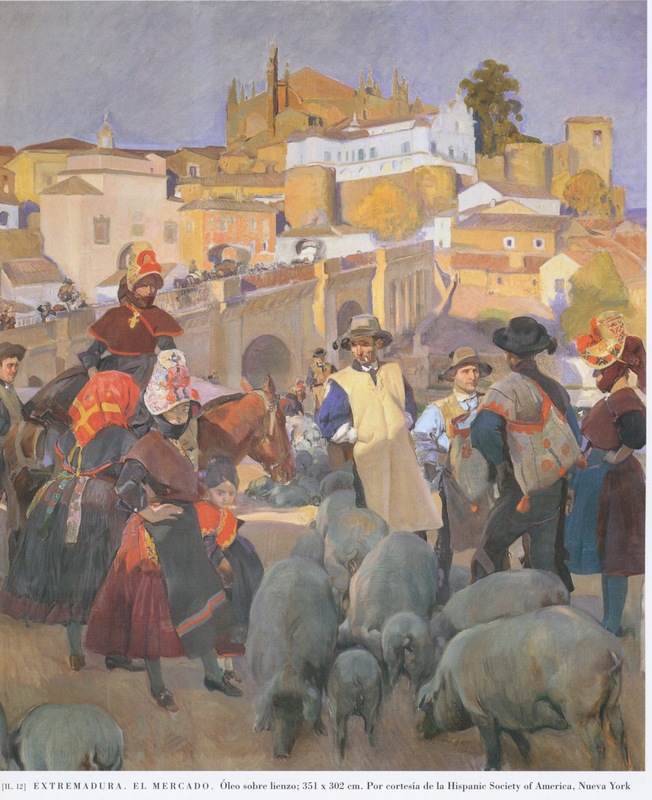 When a shawl was not worn, a dengue similar to that of Salamanca was worn over the shoulders, around the waist and tied. In this area it is called esclavina. 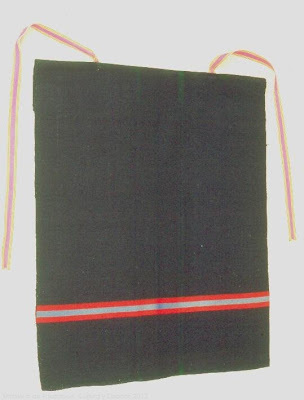 It may be plain black, it may have a colored edging, and for gala occasions a red ribbon was appliqued in a zigzag pattern a short distance from the edge. Occasionally bought trim was used instead of the ribbon gathered into a zigzag. 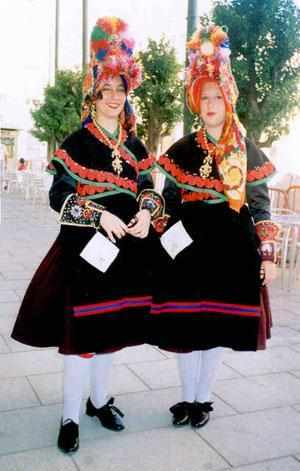 For the newer festive costume, a chemise, petticoat and at least two wool skirts are worn. The skirts are laid out, pleated, tied, left to dry, and then the pleats are sewn together with a herringbone stitch in a couple of rows at the top of the skirt, as you can see in the above photo. A flat front panel is then sewn on, and the entire skirt has a number of tucks sewn into it not far from the bottom edge. The number of tucks varies from 4 to over 20. 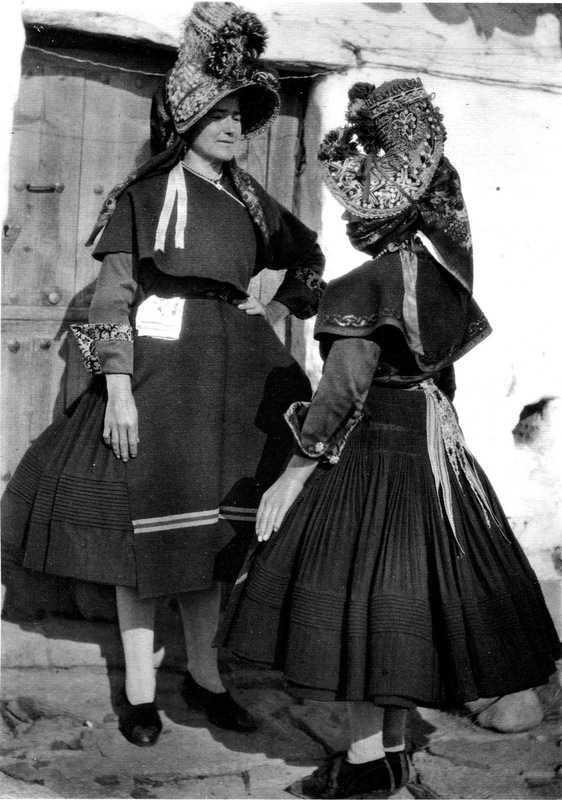 This results in the skirts standing away from the body and in being rather shorter than is usual for Spanish Folk costumes. 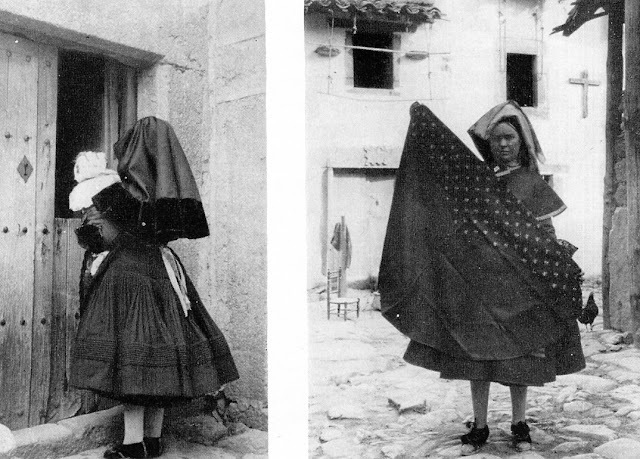 For some reason the skirt in this area is called mantilla, likely a diminutive of manteo, the word used for the overskirt in old Leon to the north. Two ribbons are sewn on to use as ties. There is a facing in a contrasting color sewn to the inside of the hem. 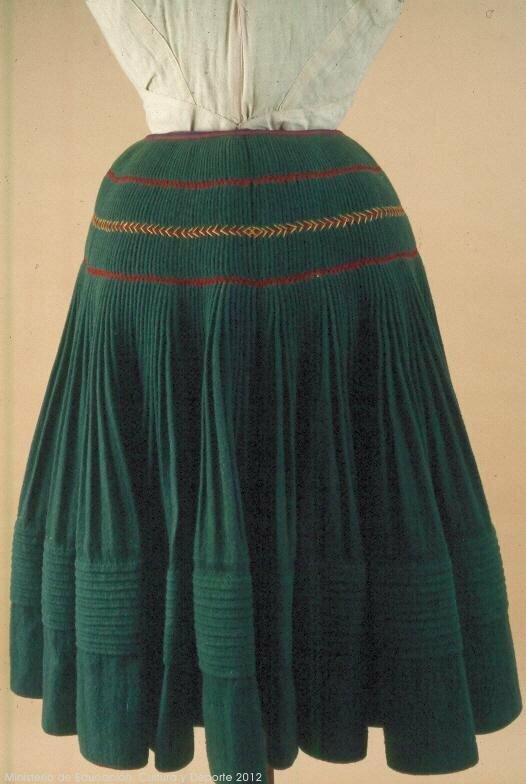 The topmost skirt is black for everyday, and for holidays is traditionally mulberry colored. 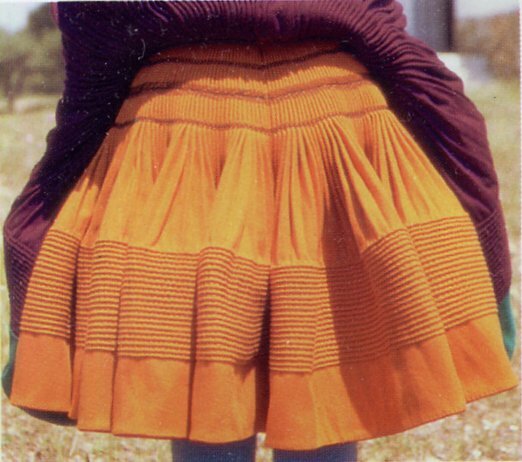 The underskirt is of a brighter color, but is sewn the same way. 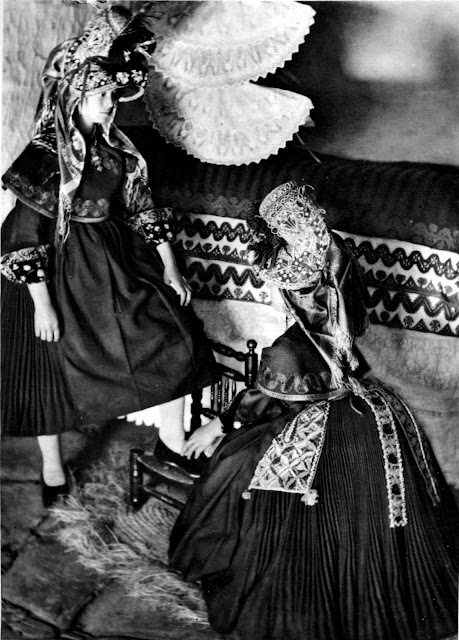 In the older ceremonial costume the tucks were not made, which made the skirt longer. 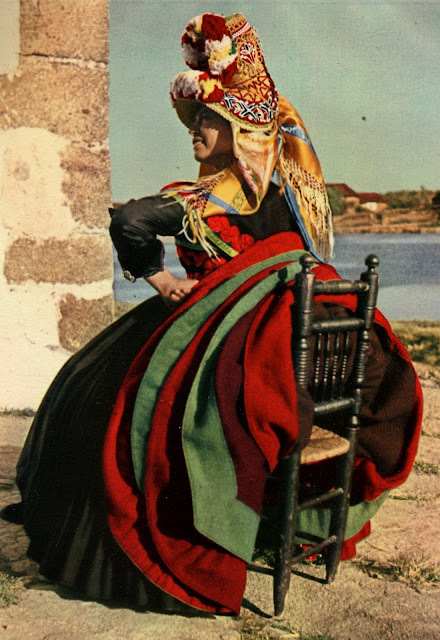 Fullness was achieved by wearing 6 or 7 such skirts, in a traditionally determined order of colors. You can see here the fine silk of the kerchief, as well. 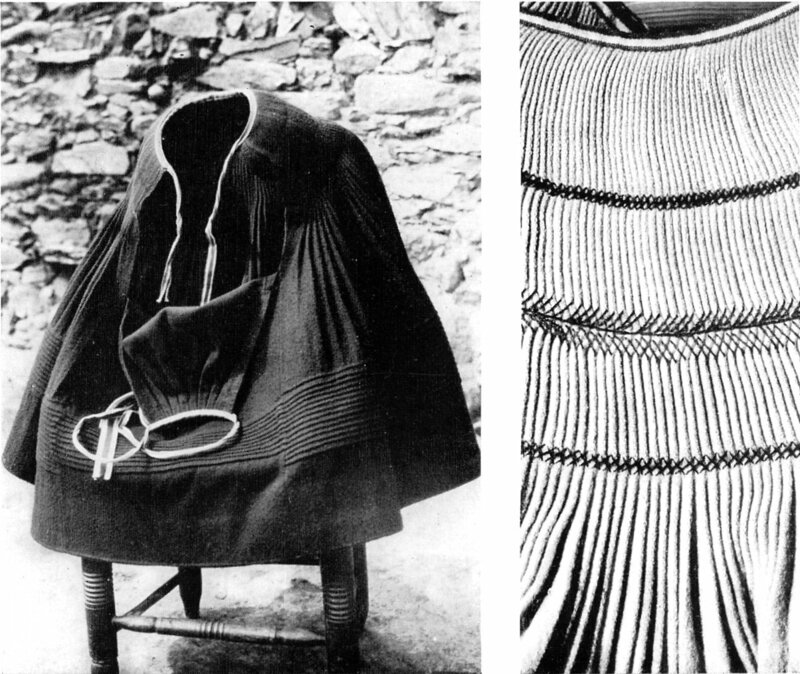 For less important occasions a full gathered apron was worn. For festive wear the mandil was a single panel of cloth, with a ribbon sewn near the bottom edge. The ribbon is traditionally woven in stripes of blue and red. The top was folded over, and two more ribbons were sewn on as ties. 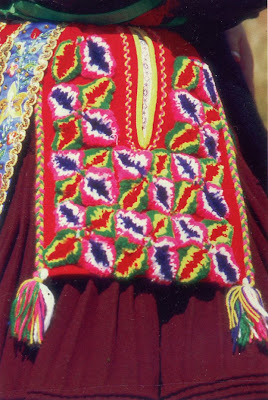 A loose pocket, the faltriquera is worn on the side, as it is in Salamanca. 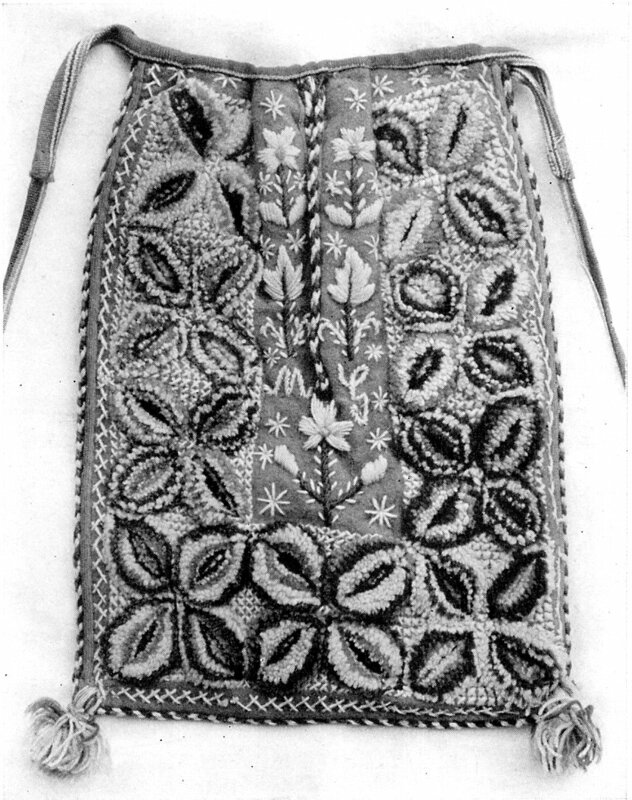 It is made of black or mulberry wool, and may be edged with applique. 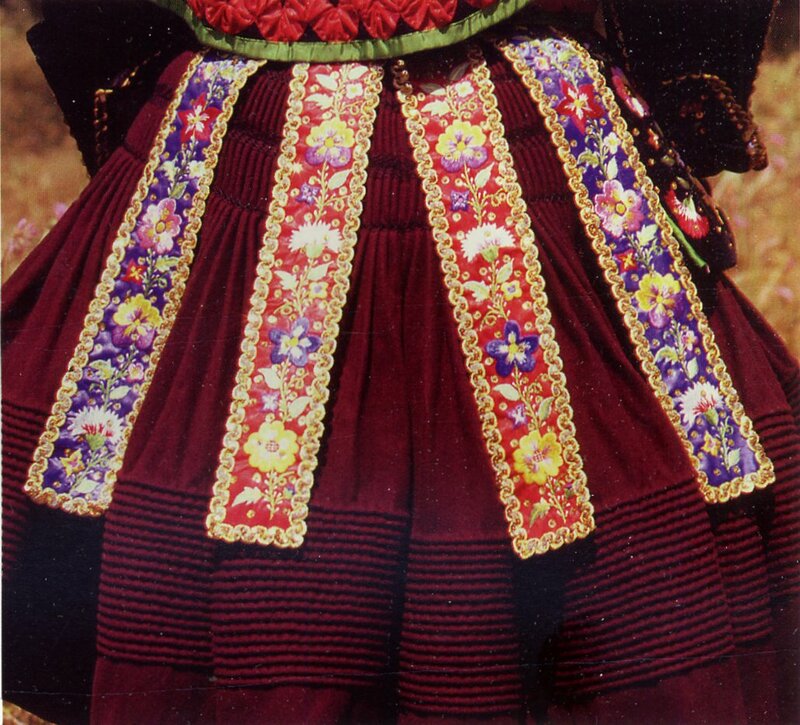 Formerly it was usually ornamented with cut loop or punch-needle embroidery, forming three dimensional flowers. Today it may be embroidered in the same manner as the women's cuffs and men's lapels. 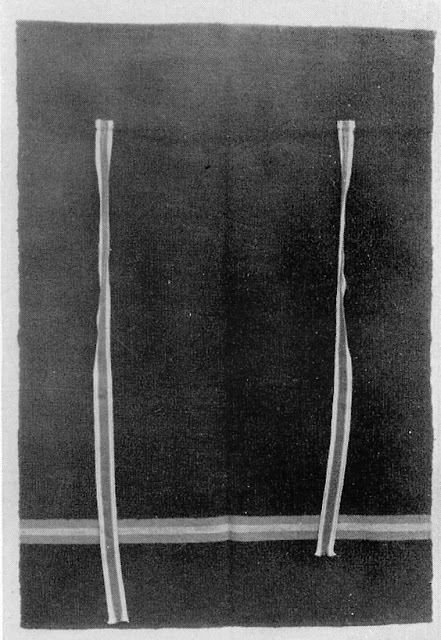 Four streamers hang in back over the top of the skirt. 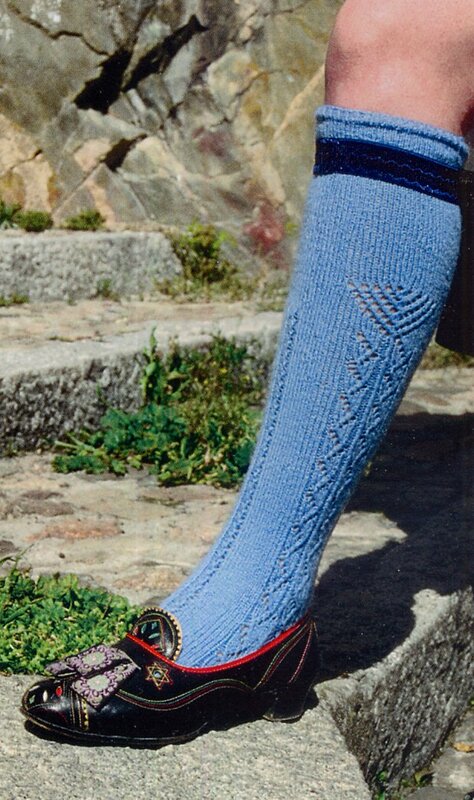 These may just be brocade ribbon, or patterned ribbon sewn with trim, or they may also be embroidered. Medium blue stockings are worn for both everyday and festive wear. 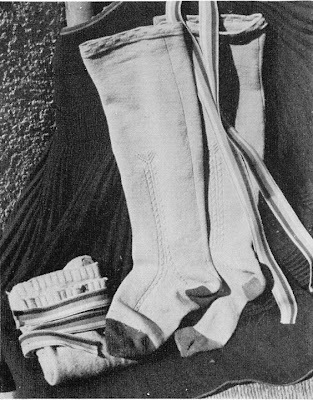 They are held up by garters made of the same ribbon which serves as ties for the skirts and aprons. The knees were traditionally left bare. 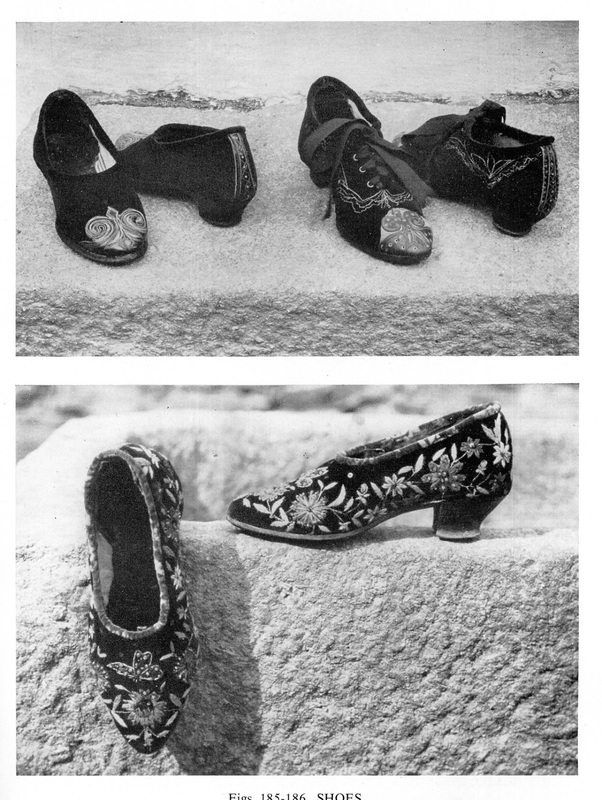 Shoes may be plain black, or more or less ornamented depending on the occasion. Women would sometimes have the shoemaker cut out velvet or other cloth for the shoes, embroider the pieces and then have them assembled. When in mourning or widowed, the costume is the same, except that the colors used are restricted to black, violet and dark blue. 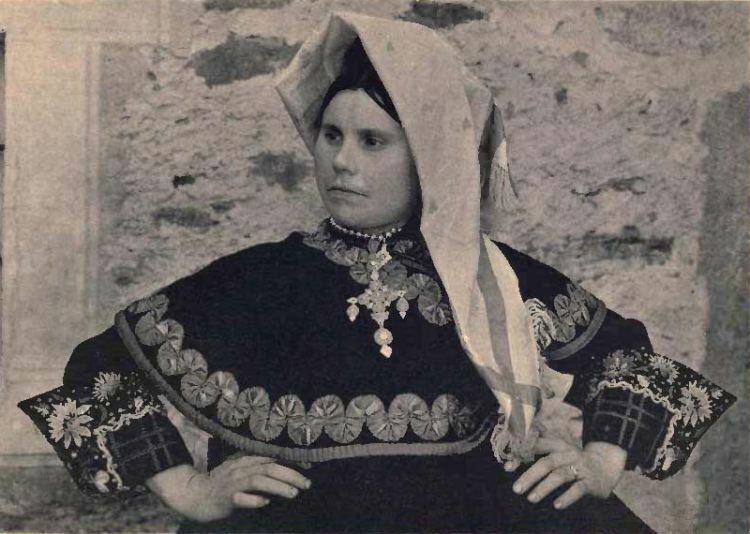 The kerchief may be tied in many ways, but often it was just placed on the head, one or both sides folded back, and kept on, as one observer put it 'by force of personality'. 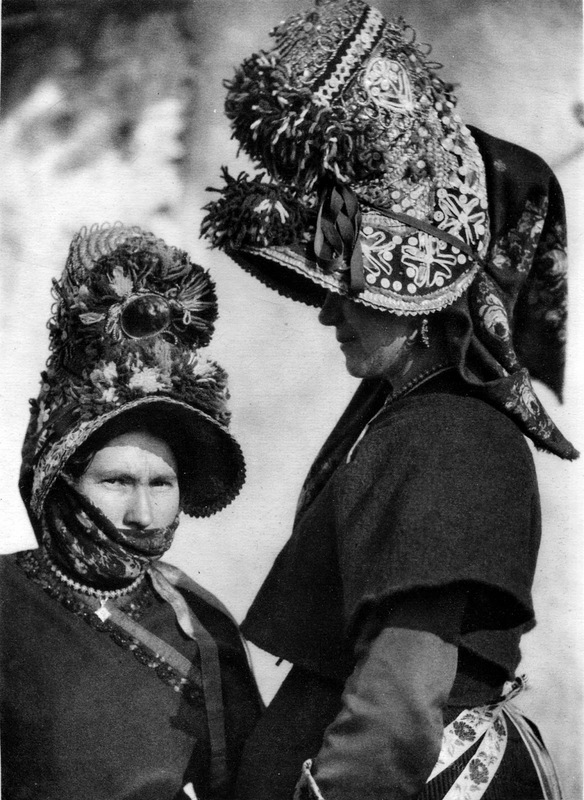 There is one more type of headgear which was worn for ceremonial and church occasions, when the gorra was considered inappropriate, and a kerchief insufficient. 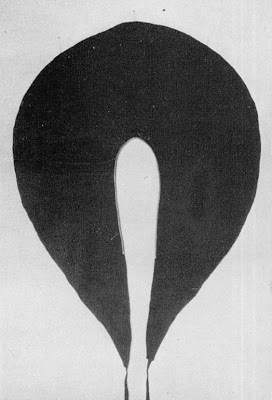 This is a mantle which was worn over the head. 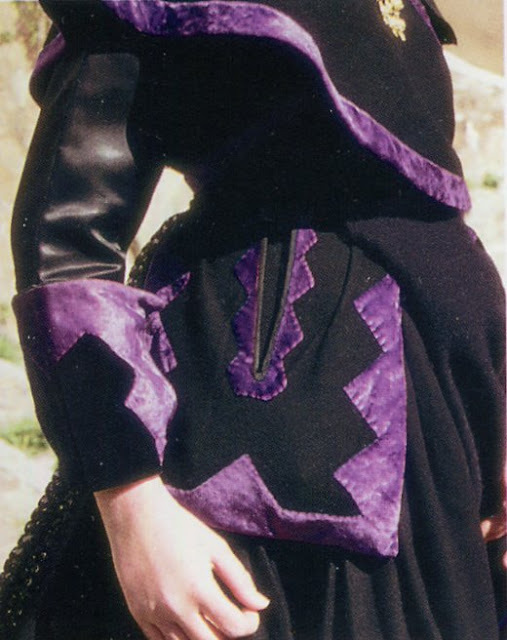 It is a half circle of black broadcloth, with a lining of challis along the front edge and on the top where it sits on the head. On the facing side it is edged with a deep border of velvet all around. It is stored folded, so there is a crease on top of the head. The costume is finished off with locally made gold jewelry, especially earrings and a large cross. 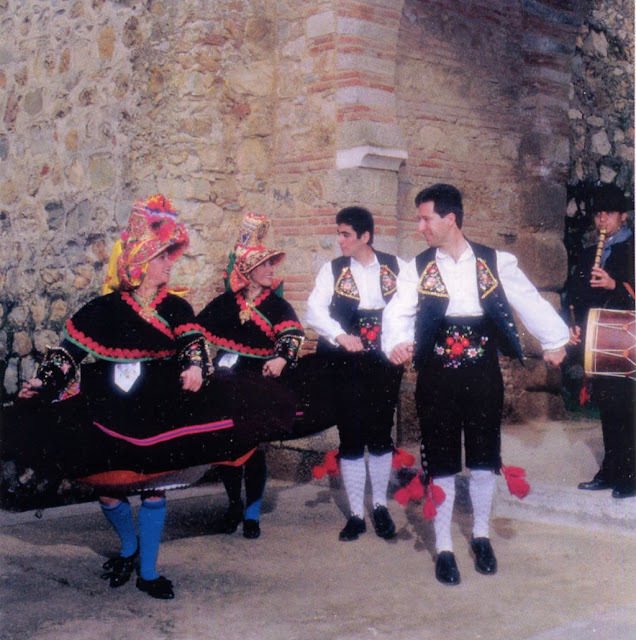 One reason that the local costume tradition has survived so well in this locality is that in Montehermoso they do not have the tradition of burying people in their best traditional attire. They consider that to be a waste, and I wholeheartedly agree. Just a few more images to close the article.